For example, as MAG Ireland has previously pointed out, there is no EU proposal to ban bikes over seven years old from urban centers. This was in fact a domestic French proposal, and while it’s unlikely to be made law even in France, there is a possibility that it could happen. In that scenario, however unlikely it may be, the proposal could – in theory – be later taken up at EU level. So it’s not a threat we face from the EU right now. Equally, there is no EU proposal for mandatory high viz. Again, this is a domestic proposal. In this case the first ones to propose it were our own Road Safety Authority back in 2009. The French also had a similar proposal on the table, and while riders quite rightly demonstrate against these proposals, it’s important to understand that they are not EU proposals, but domestic ones. The important thing here is that the RSA have said they intend introduce regulations for mandatory high viz, so it is a very real threat that you’ll be forced to wear one. 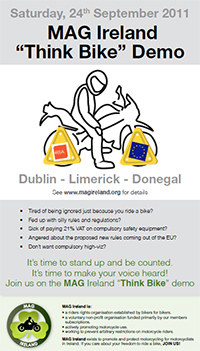 MAG Ireland has highlighted the various anti-bike proposal protest demonstrations against EU proposals and their own home grown quangos (Mandatory high-viz) which are timed to coincide with MAG UK’s day of action. 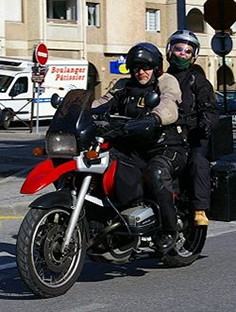 A number of different riders groups, individuals and biker forums are organising protest rides for Sunday 25th September to protest various anti-bike proposals both from the EU (Type approval, etc.) and our own home grown quangos (Mandatory high-viz). Our freedom to ride is under threat as never before. Protests are taking place countrywide, and are timed to coincide with MAG UK’s day of action. MAG Ireland have listed the start points for these demonstrations from: Wexford – Galway – Monaghan – Cork – Westmeath – Dublin – with links to the biker forums which contain the full details. In the meantime this is what we have so far from the MAG UK Facebook page. M1 – Junction J7/8 Sprucefield Park and Ride, Lisburn. Please note: In Northern Ireland public demonstrations such as the above are subject to government regulations under the auspices of the Parades Commission and the PSNI. The onus is on the organisers/coordinators/starters to ensure that these demonstrations are legal. Right To Ride is not responsible for the organisation or coordination of the above mentioned or other related demonstrations. “Think Bike” Demo – 24th Sept. Finally MAG Ireland have organised a “Think Bike” demo for Saturday 24th September in Dublin with additional demos now listed for Limerick and Donegal. Departs 11:30am Ends at the Popes Cross Phoenix Park. All queries must be directed to the organisers. A weekend of protests by Irish bikers saw thousands take to the streets and vividly demonstrated the depth of feeling in the biking community. Many participants voiced their anger towards the RSA over it’s proposals to foist mandatory high visibility clothing on riders, and also their frustration with the EU which continues to chip away at our rights and freedoms in the name of harmonisation. To reiterate the demos in Northern Ireland are organised – co-ordinated – with the Motorcycle Action Group UK. These are being discussed and information available using Facebook. Which includes a start point from Junction 7/8 M1 Sprucfield Park and Ride Lisburn. We do not have any further information regarding this. There also appears to be a demo run from Bangor Seafront Bikepark meeting at 11,30 Sunday morning to meet up with demo at City Hall. Right To Ride is not responsible for these protests. We will be going to Brussels next month to voice our concerns directly to the decision makers. • Tired of being ignored just because you ride a bike? • Fed up with silly rules and regulations? • Sick of paying 21% VAT on compulsory safety equipment? • Angered about the proposed new rules coming out of the EU? • Don’t want compulsory high-viz? • a riders rights organisation established by bikers for bikers. • actively promoting motorcycle use. 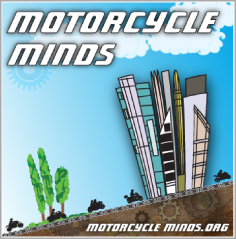 • working to prevent arbitrary restrictions on motorcycle riders. MAG Ireland exists to promote and protect motorcycling for motorcyclists in Ireland. If you care about your freedom to ride a bike, JOIN US!